Prevention & Mitigation project is aim to support the overall DRR strategy of Caritas Pakistan. It is also being implemented in some areas of CBDRM project. The project methodology is based on risk assessment, disaster preparedness but emphasized on structural activities. Risk assessment to make appropriate plans and implement concrete actions to reduce and / or eliminate disaster risks through genuinely sound disaster risk reduction interventions. In disaster preparedness the major activities include local capacity building/institutional development, mass scale education and awareness raising, school safety plans, facilitation and coordination with government line departments and key actors for disaster risk reduction and advocacy activities with government at tehsil, district, provincial and national level, training of selected community members, first aid training, drills/role plays, search and rescue training at Union Council and village level, simulation exercises, mock drills, integration of disabled people, women, children and minorities. The major prevention and mitigation activities to be implemented are construction of retaining walls, embankments and small scale mitigation activities at selected sites identified by the community, renovation of evacuation routes and sing-posting in all communities, identification of seed and food storage facilities within the communities, introducing plantation of environment friendly plants and mangroves to community, small scale plantation at community level with school children and community and promotion of community based forestry and orchards for stabilisation of land erosion. District Tharparkar is one of the most under-developed regions in Pakistan. As last year’s drought emergency showed, the district’s marginalized population is extremely vulnerable to drought. A concrete need exists for strategies and interventions that will assist communities to withstand the devastating impacts of drought which can and do affect populations at multiple levels. The ultimate goal of any Caritas Pakistan intervention is to eradicate circumstances that negatively impact the dignity of the beneficiaries. The goal of this project is to ensure that communities in the drought prone region of Nagarparkar (District Tharparkar, Sindh) become drought resilient and sustainable. The project will move communities towards resilience and sustainability trough appropriate drought mitigation activities, livelihood sustainability efforts, improved food security measures and capacity building initiatives. It must be noted that this project will focus on empowering communities to manage their situation without significantly altering/changing their location, lifestyle or ethos. Keeping in view the vulnerability of the disaster prone communities Caritas Pakistan has already initiated Disaster Risk Reduction (DRR) program to enhance and improve the community based resilience of the communities of 84 disaster prone villages of 14 high hazard prone district of Pakistan. Caritas Pakistan has formed Disaster Management Committee (DMC) at every village which is executing body of the village. 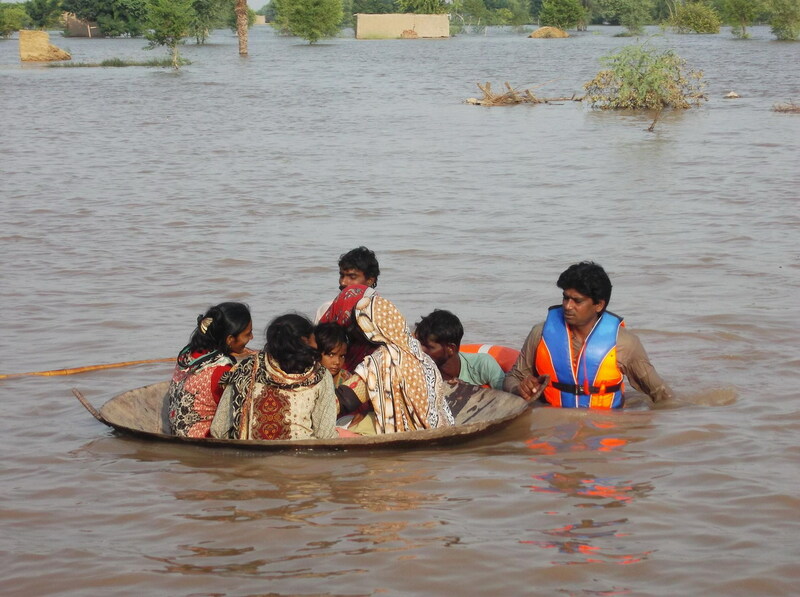 Caritas Pakistan will select extremely flood prone 20 village out of 84 villages. Caritas Pakistan will build the capacity of the project staff’s. The major inputs will be training of core staff on Community Based Disaster Preparedness (CBDP) and monitoring & evaluation exercises, development of M&E tools and checklists. The project will prepare the communities to timely respond during the emergency to save human lives and mitigate the effects of the disaster. The major activities include local capacity building, community based sessions for community volunteers, children, women and persons with disability will be organized along with provision of water proof folders/bags and wrist band. To build the capacity of vulnerable communities on disaster preparedness in 20 hazard prone villages of Pakistan. » To build up the capacity of Caritas Pakistan Staff with key skills to work with the vulnerable communities to effectively achieve the project results. Keeping in view the vulnerability of the disaster prone communities Caritas Pakistan is implementing community based disaster risk management project to enhance and improve the community based resilience of the communities with the active participation of key stakeholders including DDMA, PDMA, NDMA, district government, community and high risk populations. The project staff’s capacity and relevant skills will be built. The major inputs will be training of core staff, identification of master trainers from all dioceses, re-formation and strengthening the role of Emergency Response Support Team (ERST) at diocesan levels, capacity building of ERST team members, monitoring & evaluation exercises, development of M&E tools and checklists and exposure visit of staff locally and internationally to enhance their knowledge and grooming. 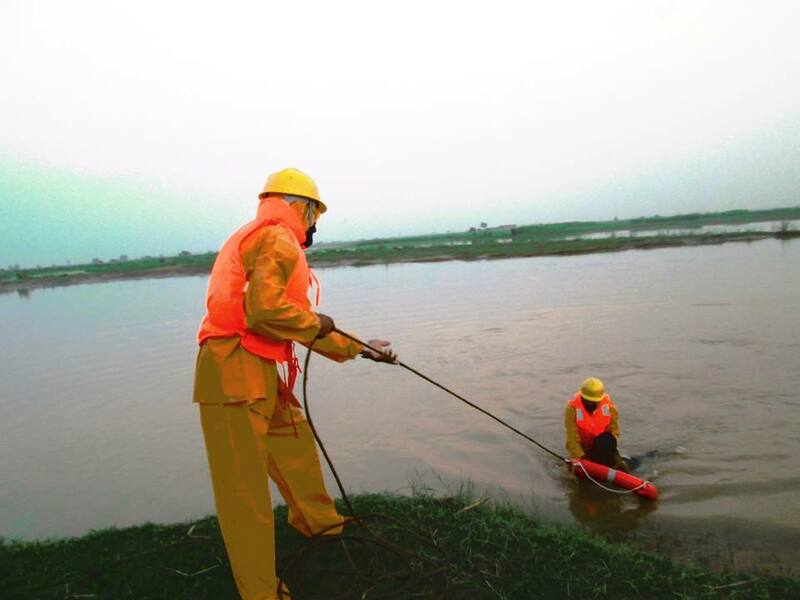 Caritas Pakistan has planned to conduct risk assessment to be able to make appropriate plans and implement concrete actions to reduce and/or eliminate disaster risks through genuinely sound disaster risk reduction interventions. All seven dioceses will identify high risk disaster prone two districts in each diocese and among them 84 villages will be identified through rigorous risk assessment exercise. 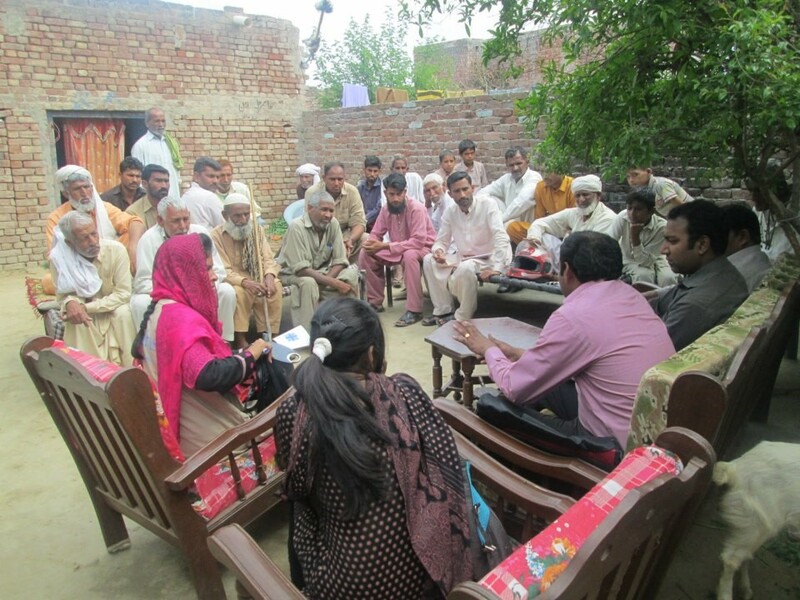 The risk assessment will be based on participatory tools including community mapping, hazard mapping, transect walks, Focus Group Discussions (FGDs), vulnerability survey among households (on tailored questionnaire modified as per community need), Focus Group Discussions with Children, meetings with community elders and influential, computation of data and analysis. The detailed working methodology will be developed with the teams during the training. This component of the project will prepare the communities to respond during the emergency for timely support to save human lives, livelihood / livestock, and infrastructure. The major activities include local capacity building / institutional development, mass scale education and awareness raising, school safety plans and awareness raising, community early warning systems, facilitation and coordination with government line departments and key actors for disaster risk reduction and advocacy activities with government at tehsil, district, provincial and national level, training of selected community members on CBDRM, first aid training, search and rescue training, development of disaster management plans at UC and village level, simulation exercises, mock drills, integration of disabled people, women, children and minorities in the CBDRM activities. After the scrupulous risk assessment finally 6 villages in each UC and total 84 villages in 14 selected districts will be selected for prevention, mitigation and preparedness activities. The major prevention and mitigation activities to be implemented are community food and cyclone resistant shelter in flood affected UCs and small scale mitigation activities at selected sites identified by the community, sing-posting in all communities,identification of seed and food storage facilities within the communities, introducing plantation of environment friendly plants like mangroves to community, small scale plantation at community level with school children and community and promotion of community based forestry and orchards for stabilisation of land erosion. To reduce the risk of natural and man-made disasters and vulnerability of communities in 14 hazard prone UCs in all seven diocese of Pakistan. » To identify hazards, vulnerabilities, coping capacities & mechanisms and potential measures for risk reduction through application of participatory methodologies. » To build up the capacity of the local community in key skills on CBDRM for organized systematic and timely response during emergencies. » To carry out structural and non structural activities for prevention and mitigation to reduce the effects of disasters. Caritas Pakistan is aimed at building up resilience of the local communities to respond to natural & manmade emergencies; enhance their information, coordination, knowledge and skills to improve the resilience and reduce the negative effects of the disaster & calamity. 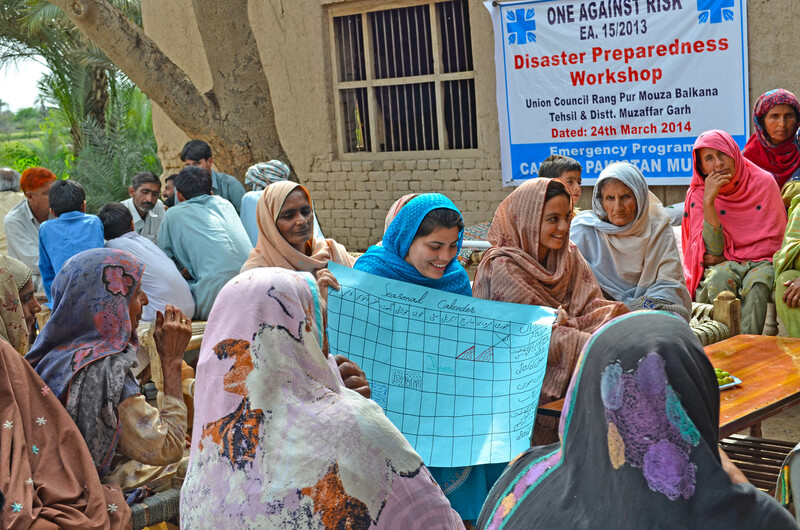 Disaster risk reduction (DRR) is focused strategic program of Caritas Pakistan. However, the drought areas have also been focused in the four years strategic plan. Priority has been focused to cater communities’ especially female and particularly female headed households, male, youth and disabled-headed households, elderly-headed households and households with high dependency ratios of income earners to dependents. DRR activities has been planned with mapping of vulnerable areas for risk assessment, emergency preparedness & mitigation planning at district level by involvement of all stakeholders with clear implementation strategies by focusing on roles & responsibilities of each stakeholder, further more evacuation roots has been proposed to be identified by placing sign boards. In vulnerable areas disaster management committees has been formulated, it will be continued in adjoining areas as well to manage DRR activities including retrofitting of safe places and construction of safety bank around vulnerable villages as well as initiation of tree plantation in respective area.